"The Narrative: The Origins of Political Correctness"
27/60-Another example of #CulturalMarxist history-revisionism (to demonize the West), is how [THEY] try to hide Izlamic Imperialism & Slavery (which continues TODAY). 46/60-And importing MILLIONS of WELFARE RECIPIENTS... is a GREAT way to implement the Socialist #ClowardPiven Strategy. "Barack #NObama & the Strategy of Manufactured Crisis"
America is at WAR w/the #NWO #Cabal & we don't even know it. Here's @ALEXNEWMAN_JOU of @The_JBS explaining the #Globalist pros/cons of @realDonaldTrump's presidency. By D.L. Cuddy, Ph.D... spanning 1912 to 1996, it's a summary of info that may be researched, verified & shared. My reply has 240+ Likes/RTs... yet it's buried under replies w/few or 0 interactions. Is Christine Blasely (FORD) actually CIA? If true, it doesn’t get much more #DeepState #NWO than this!!! It means they are trotting out the offspring of ex-Nazi OSS officers, turned CIA big wigs (#ProjectPaperclip)!!! Take a gander at GRAMPS! 1) New #Qanon post overnight links to a thread on Reddit. 2) Since these platforms enjoy deleting our accounts, I'm going to cross post it here. Note, this is not my work, though links to substantiate the dot connecting are mine. 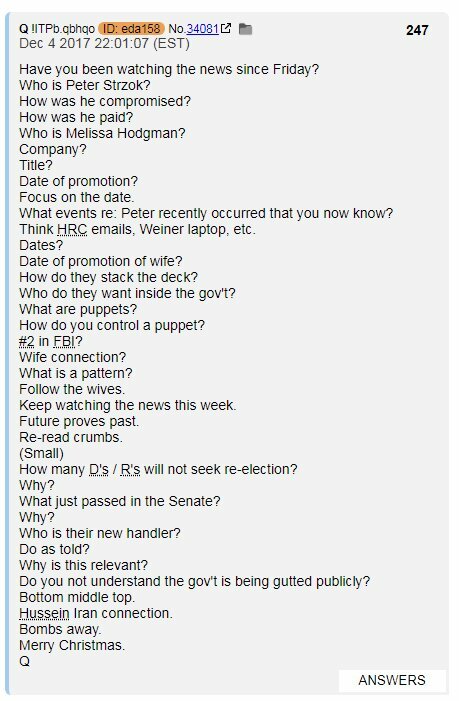 Recall back in Dec '17 Q said to "follow the wives"? Get ready for this one. 3) I am passing this on from someone who's connecting some dots with input from sources he cannot reveal. And it opens with a 💥BOOM💥 about the Federal Reserve!!!! A] Work with Columbia & Mexico to create an Industrial sized Drug Manufacturing Infrastructure. B] Open your Borders to allow the illicit drugs into the Country and us MS-13 to target low income Blacks to sell to. C] At the same time use your Police Force to target said low income Black Communities for arrest and conviction of drug users. D] Build Cottage Private Prison Industry to house convicted low income Blacks. E] Run your Campaigns to tell low income Blacks how you're fighting the System that incarcerates them at a rate 10x more than Whites. (being careful not to tell them that you designed that system that you're speaking out against).